Pay fees to any of the thirty offices of the Inland Revenue Department for police clearance re fraud (if the applicant is a body corporate, the fee must be paid for each director and secretary). 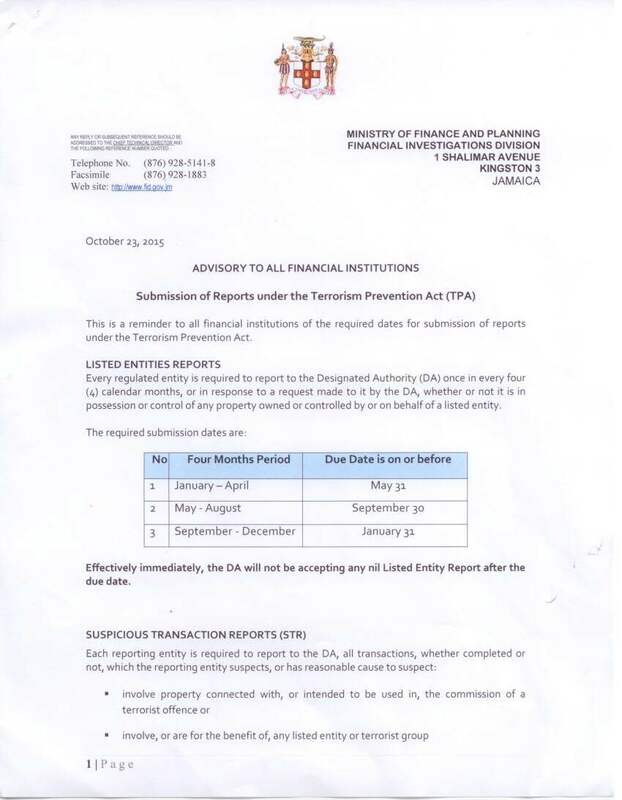 Fingerprinting is required and is done at the CIB office located at 34 Duke Street, Kingston, police stations at Summit in St. James, May Pen in Clarendon and Pompano Bay in St. Mary, where the report should be collected and submitted to the Real Estate Board. Fee: $J3,000.00 for clearance re bankruptcy (if the applicant is a body corporate, the fee must be paid for each director and secretary). 2 passport size photographs certified by any of the following: Attorneys-at-law, Pastors and Justices of the Peace (for an application as an individual). Submit proof of address; i.e. Utility Bills or letter from a Justice of the Peace confirming address. Submit evidence that the developer is the owner of land being developed (copy of registered title, Volume and Folio). Submit evidence of approval of the development scheme, including originals and copies or certified copies of approved plans and letters of approval from the local planning authority. Submit evidence of scheme financing by an authorized financial institution. For a body corporate, the application form must be signed by two directors and the company's stamp/seal affixed. All development schemes should be registered by the Board prior to their construction, marketing and advertising. Subject to the approval of the Board, where there are restrictive covenant(s) endorsed on the title of a development scheme, these must be removed prior to advertisement of the scheme and entering into pre-payment contracts. Copies of pre-payment contracts must be submitted to the office of the Real Estate Board within fourteen (14) days of their execution. All deposits received must be placed into a Trust Account. Quarterly statements, outlining all pre-payment deposits received, must be sent to the Real Estate Board. The Board must be notified immediately if funds are withdrawn from the Trust Account. Funds can only be withdrawn in compliance with the Real Estate (Dealers & Developers) Act. A charge must be lodged on the registered title for the development scheme once purchasers’ deposits have been used for payment of transfer tax, stamp duty or construction/infrastructure purposes.